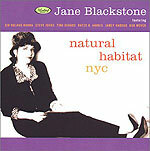 CD review: "Natural Habitat NYC"
There are jazz singers and then there are jazz singers. The spectrum runs from cats like Tony Bennett and Frank Sinatra, who don't really improvise but whose phrasing and color are very jazzlike and who draw their songs from the jazz canon, to Ella Fitzgerald and Jon Hendricks, whose voices are the equal of the brass and wood instruments surrounding them. New York City's Jane Blackstone is far closer to the latter end of the spectrum than the former. Possessed of a large, warm voice, Blackstone's choice of material on her latest release is generally challenging enough to push her voice, and always interesting. With a mix of originals by herself and the members of her backing band, and covers of Bob Dorough, Ivan Lins, Arlan & Koehler and Rodgers & Hammerstein, this is a full-on jazz set  not the easy listening or mood music that passes for jazz too often. Blackstone's strength is her ability to avoid the expected and predictable, and to do so in a manner that is surprising without being jarring. Having Sir Roland Hanna sit in on piano for several cuts doesn't hurt things any; and if the rest of the band isn't as well known, they're perfectly at home at that level of playing. Apparently, Blackstone gigs a lot around the Big Apple; listen to this album, and you're likely to make a point of seeking her out next time you're in the city.